A range of ring type current transformers suitable for primary currents from 1A-5000A with 1A or 5A secondaries. 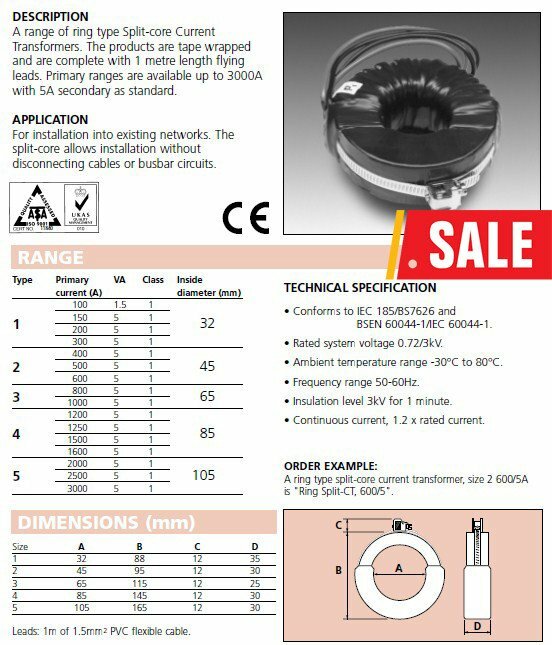 This standard range of measuring and protective current transformers is available as resin coated or tape wrapped. Suitable for measuring or protective applications with accuracies of class 0.2, 0.5, 1, 3, 5P10, 10P10 etc. Primary currents from 1A - 5000A. Choice of sizes to customers specification. Conforms to IEC 44-1, IEC 185, and BS7626. Rated system voltage 0.72 / 3kV. Ambient temperature range -30ºC to 85ºC. Insulation Level, 3kV (50Hz for 1 minute. Our production facilities allow automated printing of test cetificates for individual current transformers, if requested. Ring type current transformers can be provided with sealable terminal covers. Please specify on your order if required. When choosing the VA of a current transformer, the burden of the instrument should be taken into account. For example, moving iron panel meters require a VA of less than 2.5 . Where possible the instrument is remote from the CT, the VA imposed by the length of the connection wires should be taken into consideration. The graph opposite outlines the effect of connection wire length on VA.